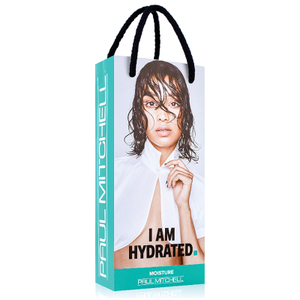 Repair your tresses from the inside out with Paul Mitchell Instant Moisture Gift Set; a must-have duo for dehydrated hair in need of hydration and protection. 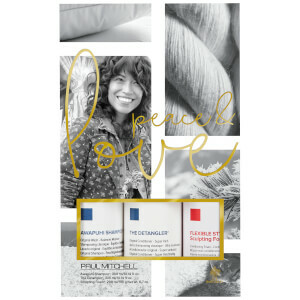 A cleansing and replenishing formula developed to revive dry, parched hair. Fortified with Panthenol, the rejuvenating shampoo expertly eliminates impurities, whilst delivering volume, body and shine for a salon-worthy finish from root to tip. Vulnerable hair is protected from the sun’s harmful UV rays, and damaged strands are repaired and revitalised. Synergising Shea Butter, Panthenol and Soy Proteins, the weightless formula helps to restore strength and elasticity to moisture-starved strands. Delivering long-lasting hydration to dry, thirsty hair, you can expect improved softness and manageability from root to tip. Provides UV protection to defend against the damaging effects of environmental aggressors. Shampoo: Apply a small amount to wet hair. Massage. Rinse. Conditioner: After shampooing, apply a small amount. Massage, then rinse. Shampoo: Aqua (Water, Eau), Sodium Myreth Sulfate, Cocamide MIPA, Alcohol Denat. (SD Alcohol) (SDA-CA-2877), Cocamidopropyl Betaine, Panthenol, Hedychium Coronarium (White Ginger) Flower/Leaf/Stem Extract, Algae Extract, Aloe Barbadensis Leaf Extract, Anthemis Nobilis Flower Extract, Simmondsia Chinensis (Jojoba) Leaf Extract, Rosmarinus Officinalis (Rosemary) Leaf Extract, Steareth-4, Dimethicone, Sodium Chloride, PEG-150 Distearate, Cinnamidopropyltrimonium Chloride, Glycol Stearate, Dioctyldodecyl Fluoroheptyl Citrate, Glycerin, Hydroxypropyl Guar Hydroxypropyltrimonium Chloride, Tetrasodium EDTA, Polyquaternium-44, Citric Acid, Glycol Distearate, Sodium Sulfate, Laureth-23, Laureth-4, Bisamino PEG/PPG-41/3 Aminoethyl PG-Propyl Dimethicone, PEG-12 Dimethicone, Magnesium Chloride, Magnesium Nitrate, Methylchloroisothiazolinone, Methylisothiazolinone, Parfum (Fragrance). Bought this for my dry hair and it makes it even drier. Very disappointed.